Darling theme! Darling decor! Darling cake! 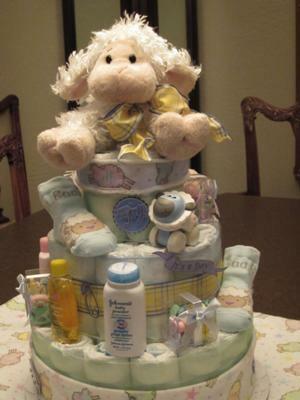 We love this Lamb diaper cake for so many reasons :) We don't see very many lamb diaper cakes, so we are delighted to post this cake and the adorable pictures. 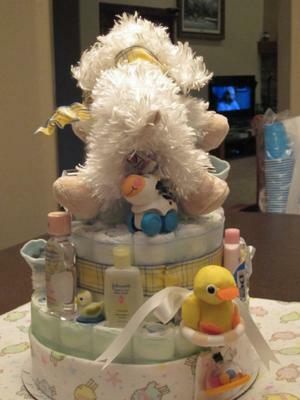 Read all about Lorie's diaper cake ides below. She has 'paid it forward' and then some with this lamb theme cake. Our readers are the most wonderful and sharing readers in the world! We love 'em! Thanks Lorie for sharing your inspiration! 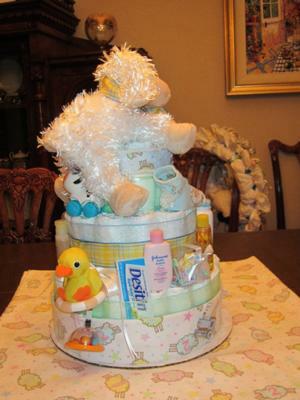 If you have diaper cake ideas to share, submit them to us right here! 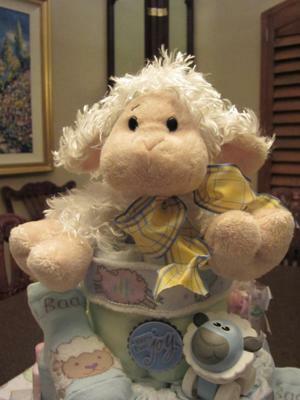 The theme was Lambs and it's hard to find Lamb decorations so I had to do some digging to get lamb items for my 1st diaper cake. I used #2 diapers. The little lamb socks I found at Tuesday Morning which I thought made the cake. The ribbon came from Michaels. I used a paper towel roll for the middle. I've since used toys, bottles and snack cups with candy in them. I couldn't find the perfect ribbon with lambs so I found some material that I liked and folded and used around the cake. I used the left over material as a base for the cake. I also used some of the ribbon to make a bow on the little lamb topper I found on Amazon. The dollar store has great ribbon and little baby items to put around the cake. I used a glue gun to attach those items. I made a matching diaper wreath for the door.